Parent HQ Local CFPs/Ttl. empl. 7 7 Meridian Trust & Investment Co. Source: Individual company representatives, individual company websites. NA=not applicable or not available. Area includes Anderson, Blount, Campbell, Claiborne, Cocke, Grainger, Greene, Hamblen, Hancock, Hawkins, Jefferson, Knox, Loudon, McMinn, Meigs, Monroe, Morgan, Roane, Scott, Sevier and Union counties. 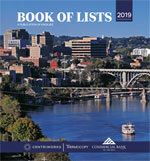 This list and other Knoxville-area market data are available as an Excel spreadsheet at www.knoxvillebiz.com. If you notice an error or omission, please contact Hayley Choy at 865-342-6494 or lists@knoxvillebiz.com.